"Zarka" redirects here. For the cantillation note of the same name, also spelled Zarqa, see Zarka (trope). For the legend of Zarqa al Yamama, see Zarqa al Yamama. Az-Zarqā (Arabic: الزرقاء‎; English: The Blue City BGN: Az Zarqāʼ; local pronunciation ez-Zergā, ez-Zer'a, or ez-Zarka) is the capital of Zarqa Governorate in Jordan. Its name means "the blue (city)". It had a population of 635,160 inhabitants in 2015. 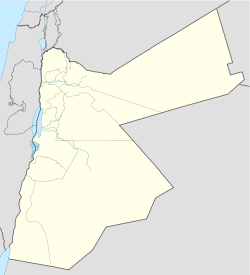 Zarqa is located in the Zarqa River basin in northeast Jordan. The city is situated 15 miles (24 km) northeast of Amman. Zarqa has a cold semi-arid climate (Köppen climate classification: BSk). The average annual temperature is 17.4 °C (63.3 °F), and around 182 mm (7.17 in) of precipitation falls annually, mostly in winter months. The Zarqa train station of the Ottoman-built Hejaz Railway. Although inhabited since the 1st century, the city of Zarqa was established by immigrants from the Caspian Sea region at the beginning of the 20th century. [disputed – discuss] The first settlement in the city was established in 1902 by Chechen immigrants who were displaced from the wars between the Ottoman and Russian Empires. They settled along the Zarqa River. At that time a station on the Hejaz Railway was built in the new settlement. The railway station turned Zarqa into an important hub. On 10 April 1905, the Ottoman governor issued a decree that allowed the Chechen immigrants to own lands which they settled on. The population then quickly grew in size. On 18 November 1928, the new Jordanian government issued a decree to establish the first municipal council for Zarqa. After the Transjordan Frontier Force was formed in 1926, military bases were constructed in the city by the British Army and the city later became known as the "military city". The headquarters of Jordan's Arab Legion was in Zarqa. With an estimated metropolitan population of about 700,000 in 2010, Zarqa has the third largest metropolitan population in Jordan after Amman and Irbid, whilst the city of Zarqa has the second largest population after Amman with a population of about 500,000. The city of Zarqa is divided into five districts that all together have an area of about 60 km2 (23 sq mi) and another two districts within the radius of influence of the city. The Faculty of Engineering in the Zarqa University. Zarqa is connected by the Hejaz Railway to Amman to the south and to Syria to the north. A new railway is currently under construction to connect Amman with Zarqa. Zarqa lies on the international highway that connects Saudi Arabia with Syria and on the international Amman-Baghdad highway. Zarqa is Jordan's industrial centre. It is home to over 50% of Jordanian factories. The growth of industry in the city is the result of low real estate costs and proximity to the capital Amman. Several facilities that are vital to Jordan's economy are based in Zarqa, such as Jordan's only oil refinery plant. According to the Zarqa Chamber of Commerce, 10% of Jordan's total exports in 2011 came from Zarqa Governorate, amounting to more than US $512 million. Leather and garment products constituted about 52% of Zarqa'a exports, followed by chemical, agricultural and pharmaceutical products. There are three universities in Zarqa, the largest of which is Hashemite University. The other two are Al-Balqa` Applied University and Zarqa University. Other community colleges and research centres are based in Zarqa such as the Al-Zarqa Educational & Investment. Also, there are many secondary schools (or high schools) in Zarqa, most notably is the Zarqa Secondary School for Boys which is considered one of the oldest high schools in Jordan. ^ "The General Census - 2015" (PDF). Department of Population Statistics. ^ Su, Alice (14 February 2014). "In the Middle East, Arabic Wikipedia is a flashpoint — and a beacon". Wired. Condé Nast. Retrieved 14 February 2014. ^ "Climate: Zarqa". 17 January 2018. Wikimedia Commons has media related to Zarqa, Jordan.